Frilled Neck Dragon Lizard Garden Sculpture...an Australian icon, the frilled neck lizard was pictured on an Australian 2 cent coin that is no longer in circulation. The frilled neck dragon lizard is an amazing reptile that is perfectly harmless but does its best to look like a Frilled Dragon when it feels threatened. In Australia the Frilled Neck Lizard is affectionately dubbed "Frilly" & is the most popular of the Aussie lizards due to its unusual looks & behavior. The Frilled Neck Dragon Lizard Sculpture is NEW to the Dupere garden sculpture collection! A full-time artist living in Arizona, Henry Dupere is a skilled & passionate metal sculptor. His imagination & sense of humor, & love of nature are expressed in his unique rusted metal sculptures! All of the garden art sculptures can be used to add a touch of distinction to any garden or home decor. 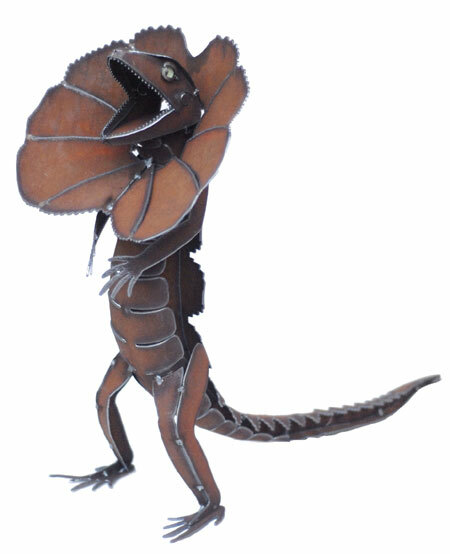 Henry Dupere Frilled Neck Dragon Lizard Garden Sculpture. Size: 20" high x 21" long x 11" wide.